Three or four years ago, while doing research at the University of Pennsylvania’s Rare Book & Manuscript Library, I stumbled upon a lost cache of some ten-thousand pamphlets. I had been browsing the papers of Stephen Colwell, a nineteenth-century ironmaster and writer, when archivist John Pollack called me into the closed stacks behind the reading room. There he showed me Colwell’s personal pamphlet library, neatly bound into hundreds of volumes. The collection also included three thousand works from the library of Colwell’s friend, Henry C. Carey (see picture to right), without question the most important American political economist of the mid-nineteenth century. The sheer size of the corpus floored me. I later mentioned this material to two Carey scholars, neither of whom had ever heard of it. It turns out the collection was somehow never catalogued even though Penn librarians regarded its acquisition as a major coup in the 1870s. And so it has remained squirreled away in the closed stacks for the past 140 years, rarely seen by scholars, effectively “lost” and waiting to be “discovered” anew. I am now hoping to organize a project to have the collection cataloged and digitized so that it can be made widely available. Step one is to do a rough initial survey, which thus far indicates that the bulk of the collection comprises British and American pamphlets from the late eighteenth and early nineteenth centuries covering a wide range of social, political, and economic issues. Recently I wrote a guest post about this for the Unique at Penn blog explaining, among other things, the significance of Carey and Colwell as historical figures and the potential value of digitizing this collection. Here I want to discuss a line of thought that occurred to me while digging through all of that forgotten commentary. In its heyday, pamphlet literature aimed for immediate impact. Its authors addressed issues occupying public attention at the very moment of their writing and often cast their contributions as direct replies to other pamphlets or articles. They also typically self-published. Inevitably this struck me as partially analogous to our blogosphere, giving me the bright idea to propose this post. Kindly Juntoists agreed but pointed out that people had made this connection before. Caleb McDaniel wrote about “Blogging in the Early Republic” way back in 2005 when “web 2.0” was a buzzword, and Joe Adelman regularly comments on this sort of thing in the Common-place column appropriately named “Publick Occurrences 2.0.” So pamphleteering as blogging is hardly a new idea. Still, my recent explorations in the Carey-Colwell collection give me the sense that it is an idea worth revisiting. The link from pamphlets to blogs first occurred to me while going through volume 149 of the collection. I noticed that in contrast to the usual hodgepodge of print types and page sizes, all the pamphlets in this volume were identically formatted. I soon found that each came from the same source, a quarterly publication called The Pamphleteer. The purpose of The Pamphleteer was to arrange otherwise ephemeral commentary on public issues into “books” of “typographical uniformity.” In this format, the editors believed, they would be saved from “the obscurity of transient opinions” (viii), preserving many a valuable argument. The editors explicitly distinguished their endeavor from the “miscellaneous and chaotic confusion” of magazines and from the “analytic and judiciary” format of reviews. They “presume[d] to think indisputable” the “novelty” of the plan (ix). To me it sounded a lot like an online aggregator. My search for the history of The Pamphleteer, admittedly fast and loose, has turned up nothing. I find this incredible. The journal did a very respectable run from 1813 to 1827, putting out at least twenty-seven volumes of two issues each. In that time it compiled several hundred pamphlets on matters of religion, foreign affairs, national defense, economic theory, education, prison reform, pauper laws, agriculture and more. Although I am not a scholar of print culture, it strikes me as a landmark publication, a kind of capstone to the golden age of pamphlet literature at the cusp of the newspaper age. Among other things it would probably make an excellent corpus for a text mining study. Certainly we would want to know who published it, which kind of opinions appeared in it (and which did not), and who read it. Colwell or Carey must have been among its readers. Here the particulars of the collection’s bound volumes suggest intriguing habits. 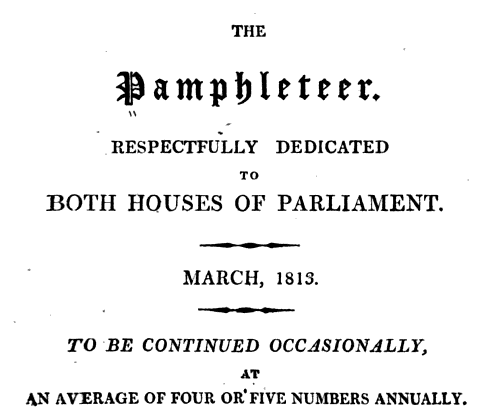 Volumes 149, 160, and perhaps others are comprised of selections from The Pamphleteer, but not in complete sets: each contains some but not all pamphlets from several different issues. This would seem to suggest that either Colwell or Carey undid the original bindings to separate out the pamphlets, precisely the opposite of the editors’ preservationist intentions. It is, of course, possible that Penn librarians did this, but it is hard to imagine why. On the other hand it is easy to suppose that Colwell or Carey meant to share specific pamphlets with others, thereby re-ephemerizing them (to coin a neologism). Another possible explanation is that the essays were separated out in order to reorder them by subject, thus creating threaded debates. If so, this supports Caleb McDaniel’s insight that grasping the era’s proliferation of media requires looking to reading practices first. Just as Bernard Bailyn’s seminal findings on Revolutionary-era political thought emerged from pamphlet-cataloguing work, I suspect that the Carey-Colwell collection can tell us a lot we do not know about the history of transatlantic policy discourse in an age of transformative change. As Joe Adelman noted last year, “it was in non-book publications—pamphlets, newspapers, almanacs, broadsides, ephemera—that much of the intellectual and political work occurred” during the eighteenth and nineteenth centuries. Pamphlets occupied a special place in this fast-moving section of the public sphere. Intended for immediate consumption, they were nevertheless longer and more detailed than other literary forms concerned with current events. They therefore promise to reveal a level of public discussion somewhere between popular reportage and rarified social theorizing, an intermediate plane particularly suited to a discourse concerned with practical policy making. What do Juntoists and fellow early Americanist/Atlanticists think? I’d be curious to see people’s thoughts about both the pamphleteering-as-blogging analogy in general and the potential value of the Carey-Colwell collection in particular. Thanks for this. I, too, have shared this view of the pamphleteer-as-blogger for a while, simply because they are both 1) occasional and responsive, embedded within a temporal flow of events and discussions rather than independent of them; 2) distributed largely through networks of like-minded or affiliated folks that “keep current” through them; 3) occasionally “break through” to reach larger audiences; 4) feature anonymous or pseudonymous authors whose identities are incidental to the larger ideological elaboration projects they serve. In many respects, the problems of reading pamphlets are analogous to the difficulties of reading periodicals, the other major non-book print form of this period. I’ve been looking at these problems largely through British side in the late eighteenth century, but I’m seeing similar issues on the North American side, too. Your aggregator The Pamphleteer sounds a lot like some of the political magazines that printers like John Almon published in the 60s and 70s and 80s, so that interested readers could collect the most important addresses, pamphlets, and speeches on contemporary controversies. Generally speaking, magazines or repositories like these were collected either from partisan perspectives, or to preserve discussion of a particular controversy. Does the Pamphleteer seem to have a specific, detectable ideological slant in its selections? Or a particular focus to its collecting? Or is it more encyclopedic and documentary? Great articulation of how exactly pamphlet and blog discursive forms are similar. I agree that periodicals fall in a similar category. One major difference for historians, however, is that periodicals may be more likely to have been preserved. Even if we don’t have complete runs, we at least know what’s missing. But pamphlets can easily vanish without a trace or, as in the case of the Carey-Colwell collection, lie somewhere without leaving much of a clue to look for them. Interesting that there were political magazines in the mid- to late 18th century that aggregated current events news. In the US I guess Niles’ Register fulfilled that function in the early 19th century. The Pamphleteer claimed to being something entirely novel, however, “to present all the most accredited and best written pamphlets upon all subjects, as they are published, but without compression or mutilation.” So it staked out a documentary role. It must also have had an ideological bias, but I don’t know enough about British history to have any sense of what that might have been. It would be wonderful to have handwritten annotations, etc., but I’m assuming that the unbinding/rebinding is as close as you get to evidence of reception (though it certainly demonstrates an element of conscious selection going on). I don’t know enough about the early 19c context to know why 19c American readers would care about 18c British pamphlets and debates by this point, or how these would get fed into American debates. One thing that does happen in the late 18c is an antiquarian interest in the documentation of earlier eras, including the political pamphlets. 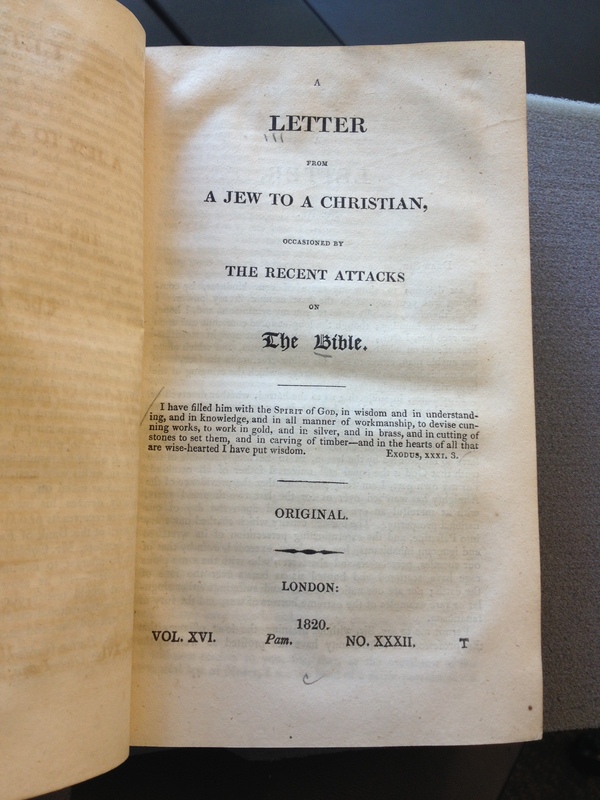 Samuel Johnson wrote a very famous Preface justifying such research for the Harleian Miscellany in the 1740s, and literary critics and historians like Isaac D’Israeli and others were doing their own versions of such antiquarian or historical interest. So I would wonder whether there’s an antiquarian dimension to this? Possibly. Whatever the Pamphleteer editors thought they were doing, it’s interesting that Carey and Colwell kept thousands of pamphlets from their own time, 1820s-1850s. They were keen observers of political events all over the globe and interested in social theory. To me this suggests that a lot of their own ideas, which appeared in numerous monographs, pamphlets, newspaper articles, etc., were shaped by a pamphlet discourse we may not have a firm grasp over. In the “nothing new under the sun” department, allow me to note that in the 17th century, Boston clergyman and political leader Increase Mather was in the habit of sewing together collections of pamphlets on politics, both civil and ecclesiastical, into coherent collections on important topics — a practice his son Cotton Mather followed as well. I’m guessing they weren’t the only ones, just the ones I know about with certainty. In the early 19th century, the American Antiquarian Society acquired a big chunk of the surviving remnant of the once enormous Mather Library, and the AAS librarians proceeded to disaggregate these pamphlet collections — mainly because that’s how they saw their mission. The purpose of the AAS was to collect, catalogue, and preserve printed titles, and each pamphlet was, of course, an individual printed title. Through some detective work and guesswork, I’ve been able to piece together the likely contents of a few of these handmade collections, but most of them are lost forever. Too bad, as it would have been interesting to know how the Mathers mentally arranged this significant part of their reading. However, this discovery of The Pamphleteer suggests yet another example of a reading-writing practice that was once handmade, manual, and do-it-yourself becoming mechanized and mass-produced, much like the newspaper or the magazine in an earlier era. Good going, Ariel! Hi Mark. Thanks for the comment. That’s interesting about the Mathers and also about the AAS. Many of the Carey-Colwell pamphlets contain notes written on the title pages which have been cutoff, apparently when UPenn bound the pamphlets and cut them down to size somewhat. Some say things like “with compliments from the author,” others seem to be about book orders and the like, but many are missing too much text to make any sense of. So it’s another case of missing out on what would have been interesting clues to reading practices. Great post, this is a really interesting area, I like the notion of the 18thC blogger. Even if you weren’t the first to make the connection, it makes for an interesting topic for discussion. I’m just starting out thinking about my Masters thesis, and am interested in information circulation during the period you’ve written about. This has given me lots to think about. Thank you, and good luck with your efforts to make the collections more widely accessible. Hi Jennifer, thanks for your comment and apologies for the delayed response (was traveling). The circulation of information in the 18th and 19th century is indeed a fascinating topic. Despite all the great work historians have done, there remain a lot of printed sources that have received little attention. I’ll be interested to find out what topic you end up focusing on. Perhaps eventually the Carey-Colwell pamphlets will be available for a similar study.